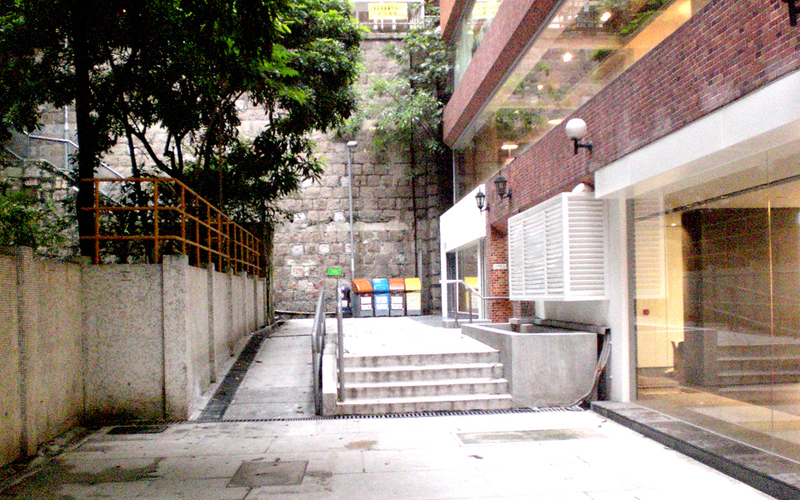 In the 1890s, the bustling trading port of Wan Chai began to grow, and rapidly became characterised by its original Edwardian terraced buildings, the abundance of small metal craft workshops in the area, a thriving Catholic community and Hong Kong’s first electrical power station. 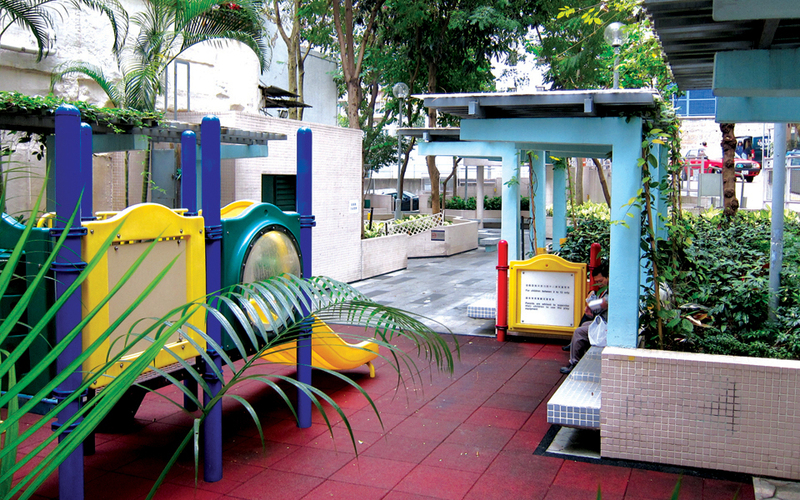 However, in the decades following, this once vibrant district began to lose its lustre and fell into gradual decline. 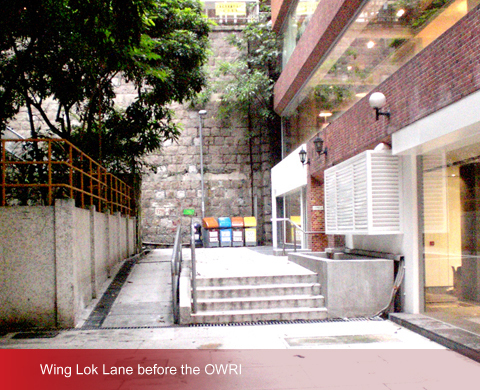 In 2009, at the request of the Old Wan Chai Revitalisation Initiatives (OWRI) Special Committee, we submitted a proposal to revitalise the south-west end of Wan Chai, affectionately known as ‘old Wan Chai’. 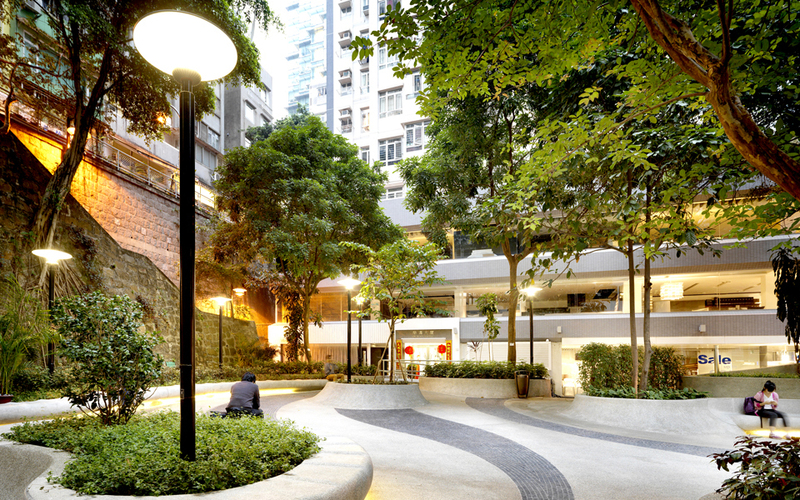 This public-private partnership between Swire Properties and the HK Government was a visionary attempt to revitalise a historic district, introducing a more modern and accessible environment for its inhabitants whilst preserving memories of the area’s colourful past. 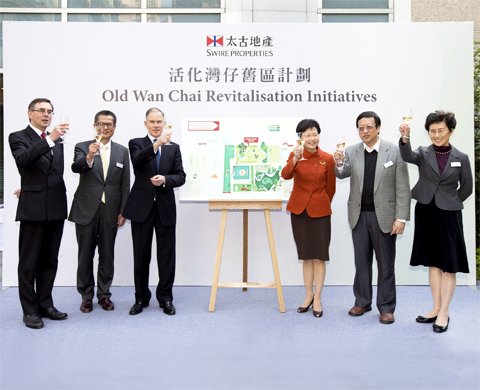 Four years since the formation of this partnership, on 6 March 2013, we gathered together on a sunny day with our guest of honour, Mrs Carrie Lam, Chief Secretary for Administration of the HKSAR Government, and members of the OWRI Special Committee and other government departments to celebrate the completion of this special regeneration project. 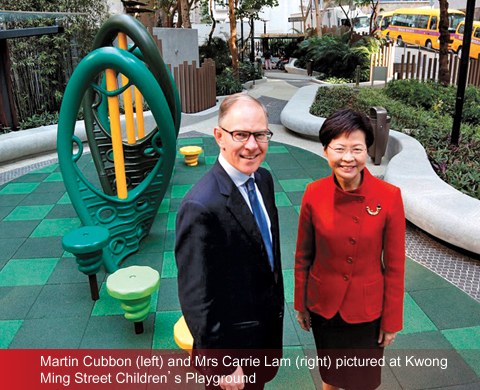 Held in the Star Street precinct, just a short walk away from the OWRI sites, the event commemorated the success of both the project and our first collaboration with the HKSAR Government. 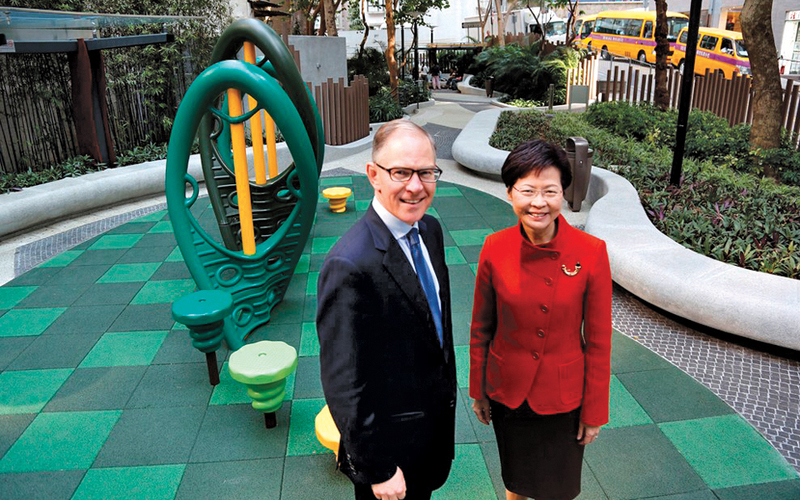 Mrs Carrie Lam also took to the stage to reminisce about her memories of this district: “I was born, brought up, in this district, and went to school for 13 years right down the road. 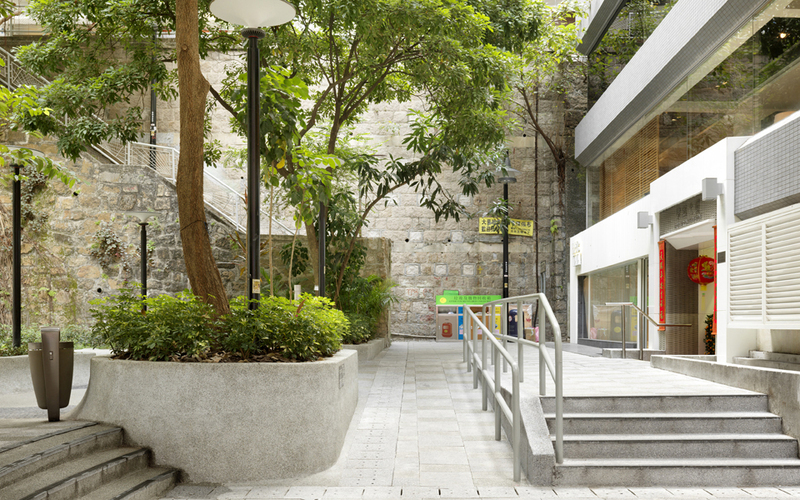 And I’m still coming back every Sunday for my Sunday Mass in the very lovely little church just on Star Street.” Mrs Lam also talked at length about the Public-Private Partnership scheme and described it as a ‘win-win-win’ solution for urban regeneration in Hong Kong. 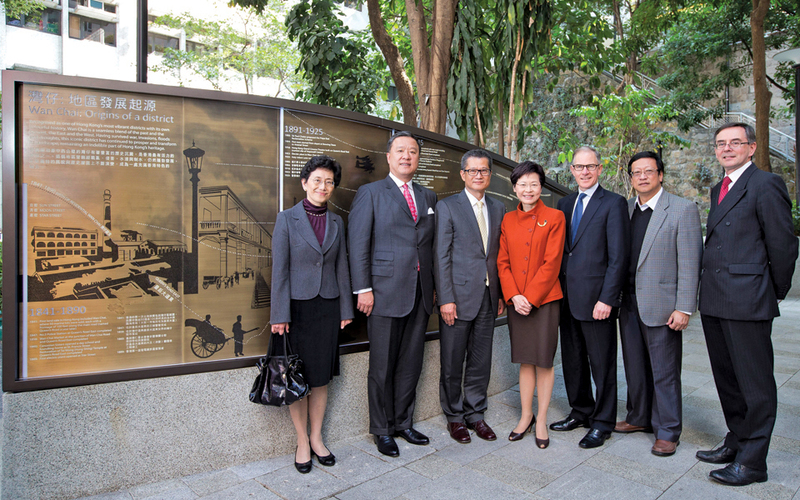 Other VIP attendees at the event included Mr Stephen Ng, Chairman of the OWRI Special Committee and Vice-Chairman of Wan Chai District Council, Mr Paul Chan, Secretary for Development Bureau, Mr Barry Cheung, Chairman of Urban Renewal Authority and Ms Iris Tam, Managing Director of Urban Renewal Authority, who together with Gordon Ongley (COO – Hong Kong) joined Martin and Mrs Carrie Lam onstage to sign a stunning illustrated map of the OWRI project and toast to its success. Our VIP guests were given a special tour of the OWRI sites prior to the ceremony, and afterwards continued the festivities with the rest of our guests at a cocktail party indoors. 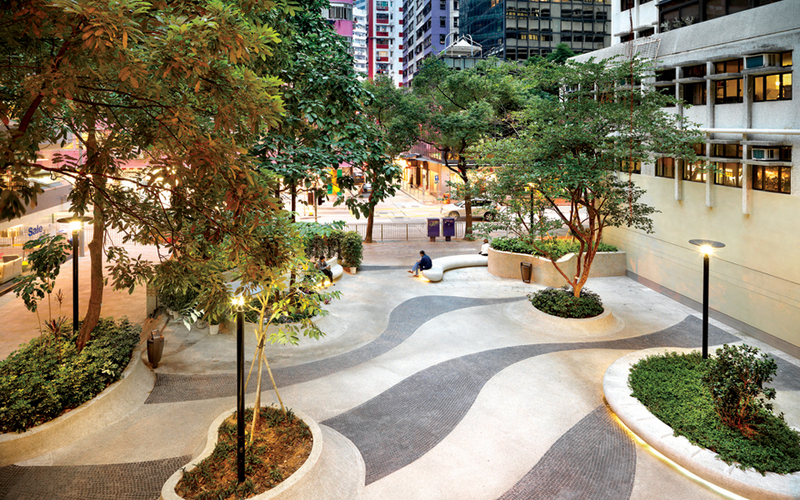 We embarked on the OWRI project with the intention of rejuvenating a major Hong Kong district, an area we have helped shape over the past 20 years with Pacific Place and the Star Street Precinct. 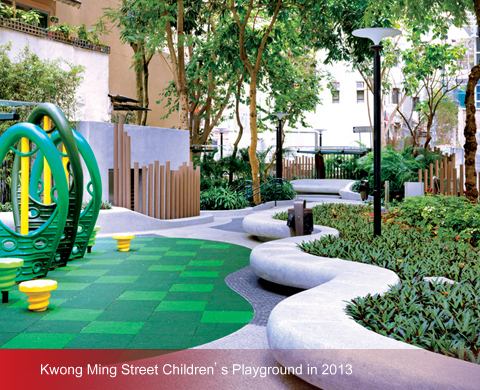 We were keen to bring a new vitality to the area without making fundamental changes, and focused on making improvements to two popular garden sites, Kwong Ming Street Children’s Playground and Dominion Garden, as well as the shared streetscape of Star Street, Sun Street, Moon Street and St. Francis Street. 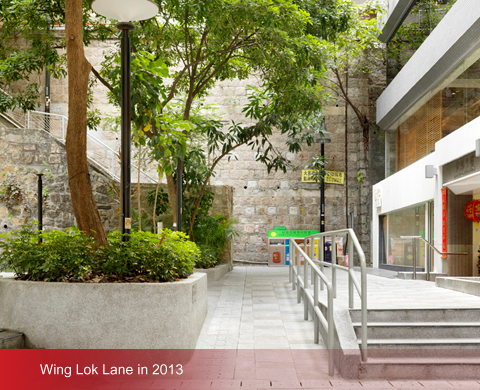 We held a 17-day public exhibition in the early stages of the project to showcase our design vision and collect feedback from the community. 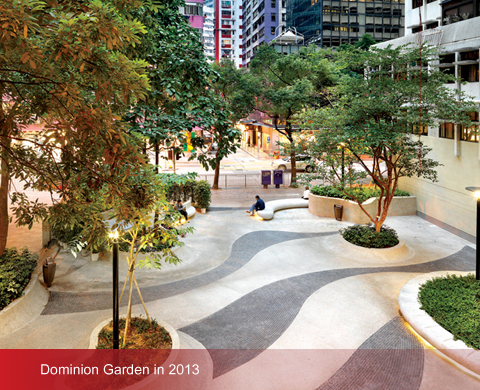 More than 700 people visited the exhibition, and their feedback was incorporated in our redesign. 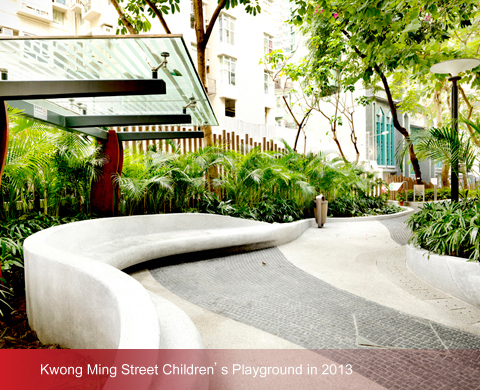 Both Kwong Ming Street Children’s Playground and Dominion Garden were, in their previous incarnations, rather dark and gated up. We updated both sites to make them brighter and more open and accessible. 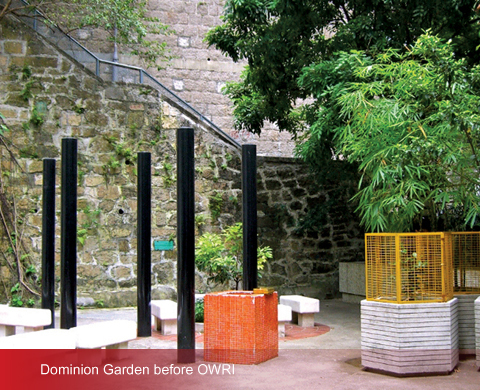 The redesign included more entrances, with high walls being either removed or replaced with a rolling curved fence. 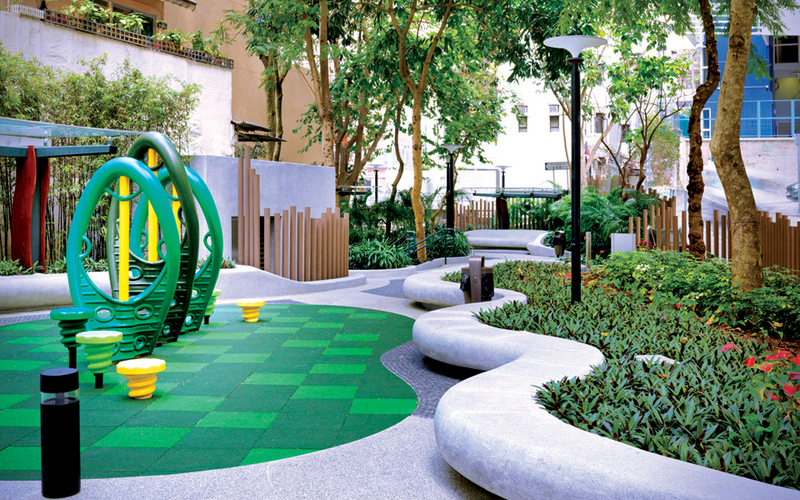 This softer approach was continued inside the parks, where wraparound benches were shaped around the existing trees and greenery, creating a gentle winding interior. 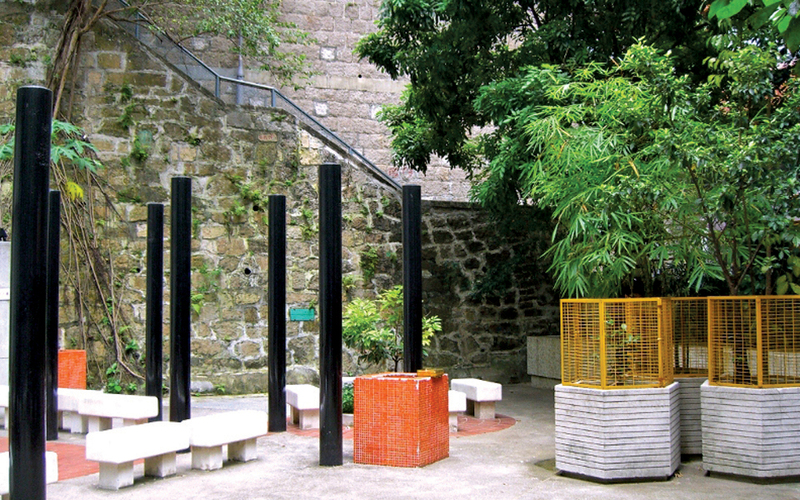 To soften the lighting, fibre optic lighting was inserted beneath the seating for a cosy lighting effect in the evenings. 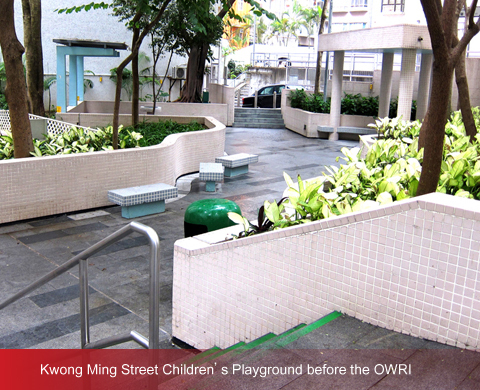 We wanted to acknowledge the district’s heritage with some nostalgic design touches, and so revived an old paving technique featuring stone mosaics for both gardens. 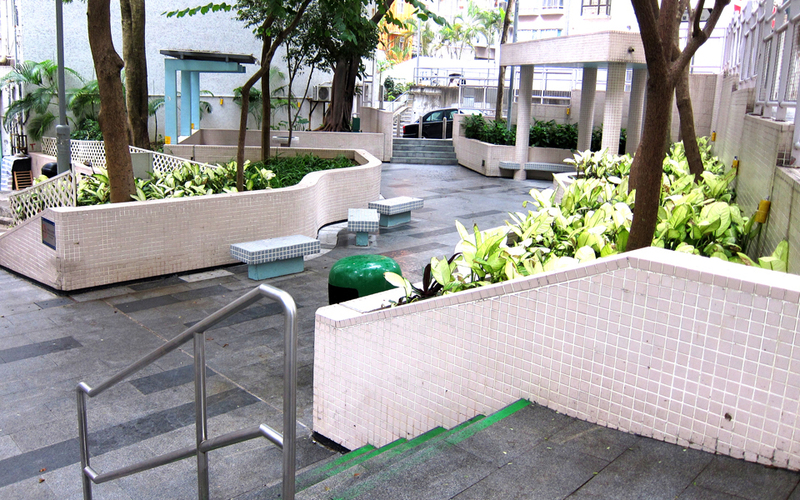 Portuguese settlers had brought their design language, including these stone mosaics, with them when they first migrated to Hong Kong and resided in old Wan Chai in the 1900s. 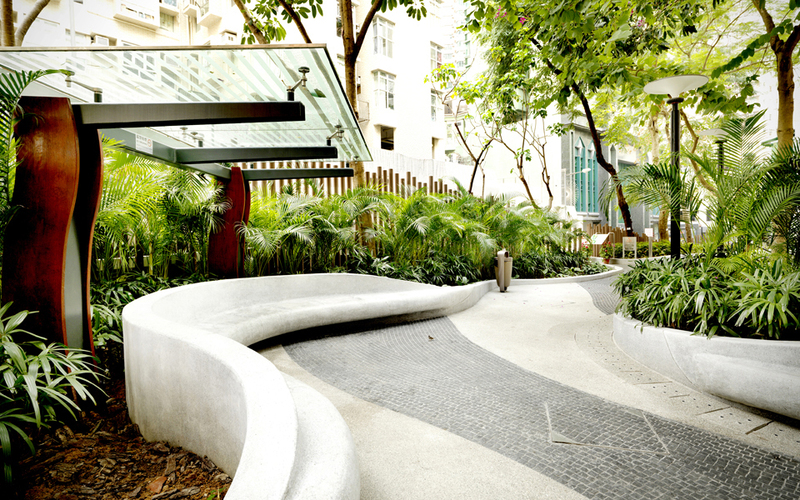 We carried out this specialist design work, resulting in a unique style of paving in natural stone and with varying colours and textures. 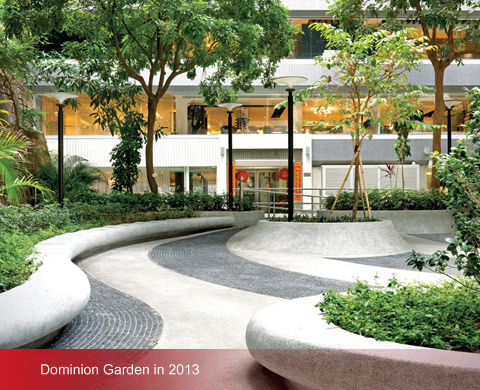 The greenery was also an important design feature for the garden sites. 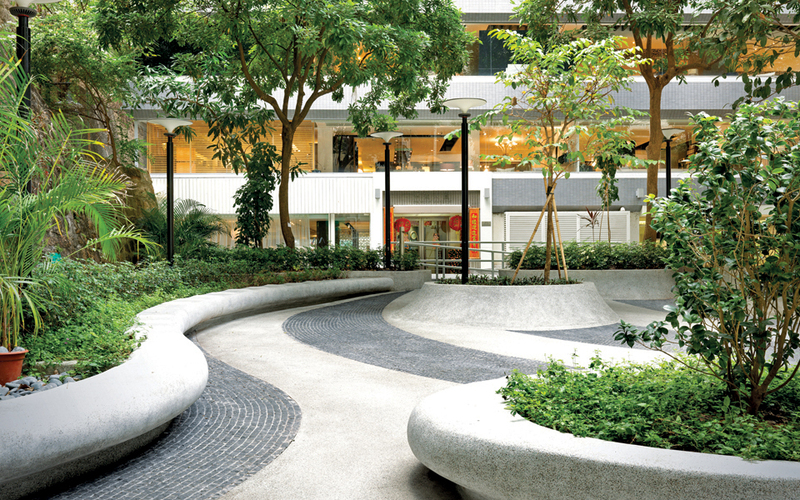 Most of the greenery in the parks was left intact, and new plantation and flowers were carefully chosen and architected to create a balanced and interesting soft landscape. 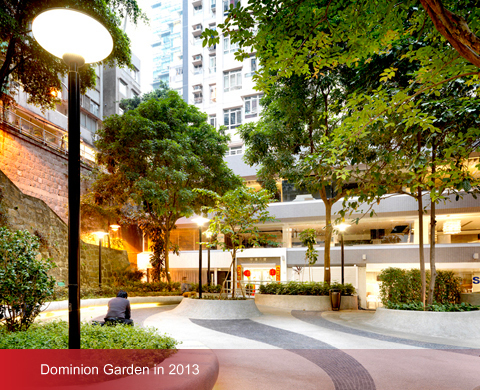 Special attention was also paid to the details of the pedestrian networks. 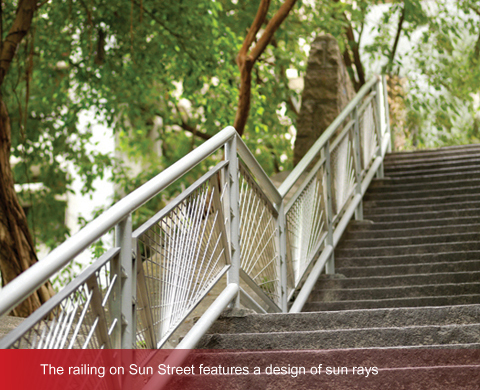 In a nod to the street’s name as well as to the celestial-inspired names of the surrounding streetscape (‘Moon Street, ‘Star Street’), the stair railing on Sun Street was designed to resemble rays of sunlight, whilst utilitarian lampposts on the street were replaced with a sleek sculptural design to modernise and update the space. 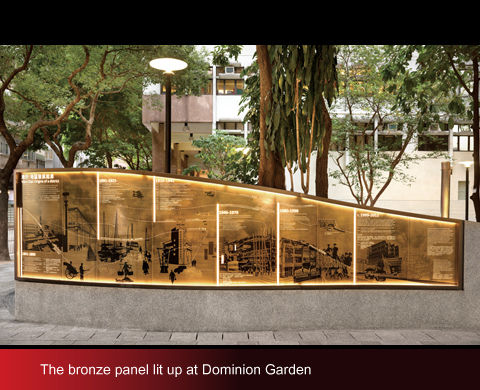 One of the most striking new features of the OWRI is the bronze panel on the wall of Dominion Garden, which details the history of the area and important milestones. 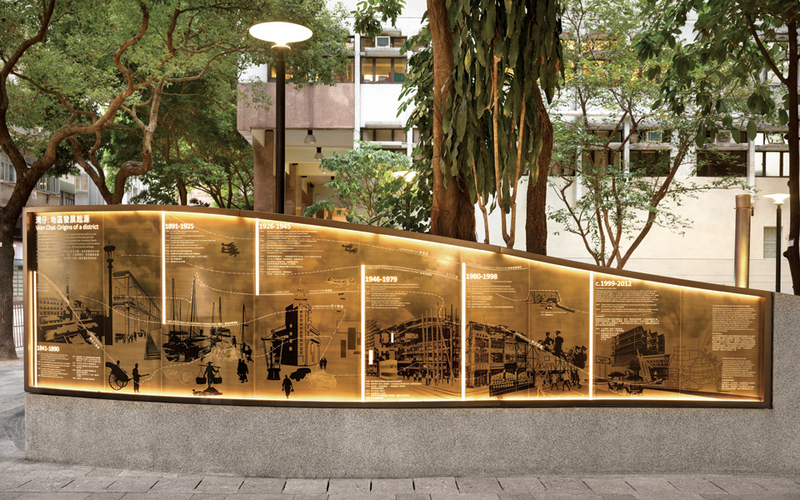 The panel boasts four different design techniques, namely printing, embossing, engraving and etching, to tell the story of old Wan Chai. 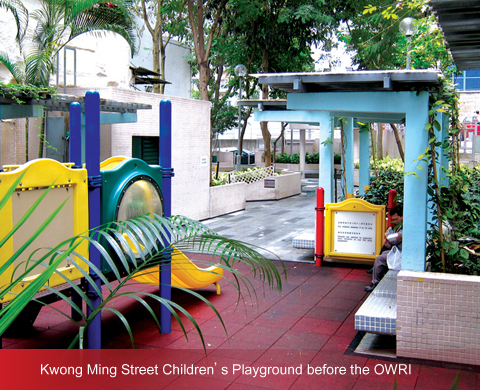 The HK$25 million OWRI project was a unique opportunity for Swire Properties to collaborate with the HK Government and other parties to restore some of old Wan Chai’s former glory and give its close-knit community a modern and comfortable neighbourhood. 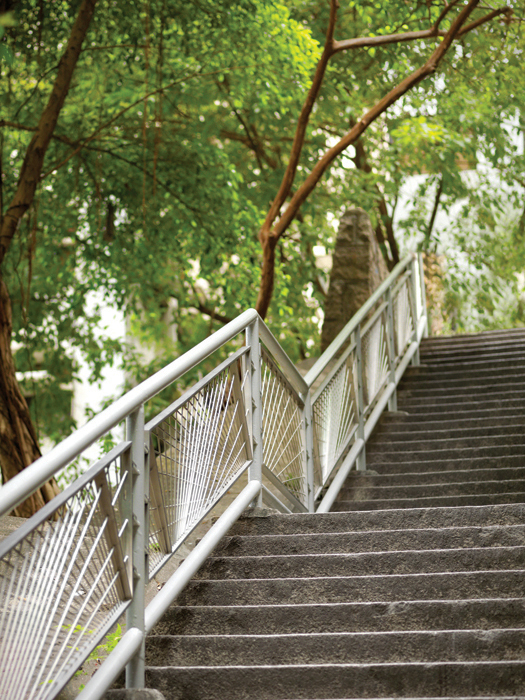 With its elegant enhancements and tributes to its fascinating past, old Wan Chai looks set to fulfill its transformation into a prosperous and creative new enclave in Hong Kong. 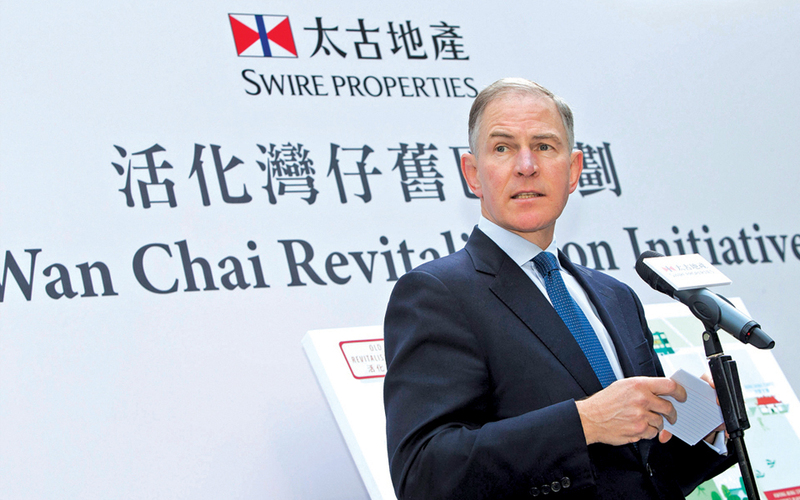 © 2012-2013 Swire Properties Limited. All rights reserved. 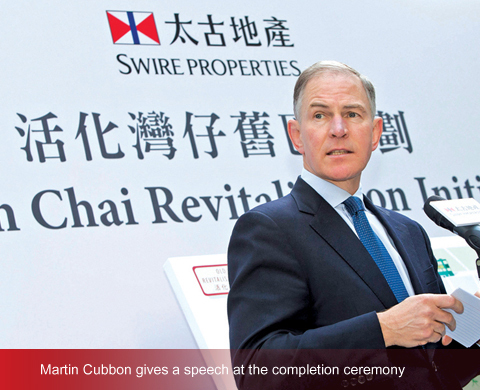 For enquiries, please contact Swire Properties' Public Affairs Department.